This weekend, in celebration of my birthday, I went out to dinner with a group of dear friends with included my Chocolate Companion and my best friend who was born on National Chocolate Day. 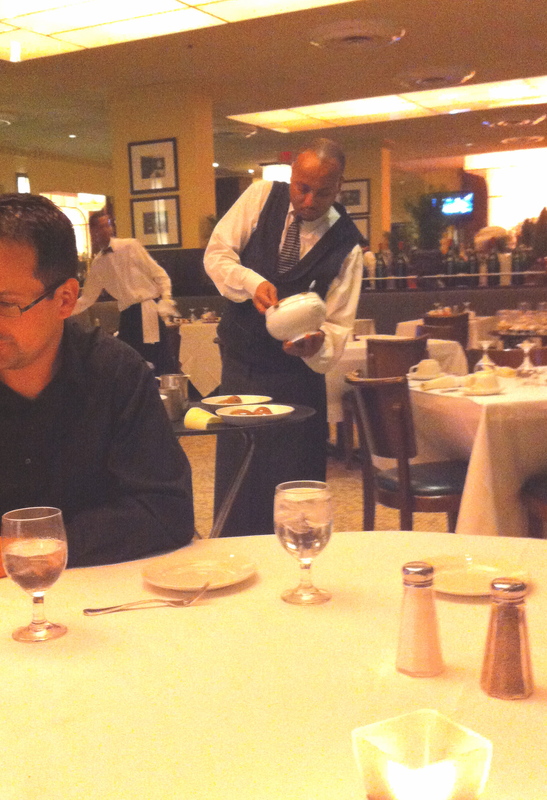 For the fourth year in row, I selected Brasserie Jo in the Colonnade Hotel in Boston as the location of the dinner. If you’ve never been, this French bistro-style spot has a lovely Parisian feel and a good amount of space and variety of seating so that even when the place is packed, you don’t have to yell to be heard, even at a larger table. Since I had been to the restaurant before, I was not unfamiliar with the food they serve, as well as, of course, the desserts. As a matter of fact, a couple years ago, at the Boston Concierge Convention, I met the restaurant manager at the time who was there with their pastry chef, handing out cups of the most incredible pots de crème, which I was lucky enough to bring home to share with my roommates. We had so many, in fact, that that week we held a sort of contest called “What doesn’t chocolate pots de crème go with?” (turns out, nothing really). 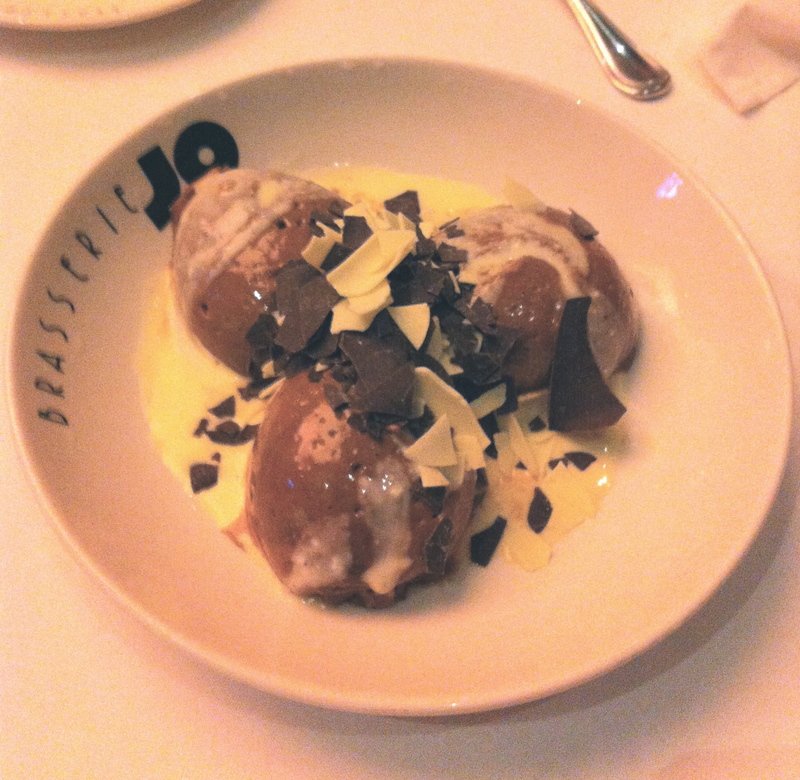 When we came to the restaurant a few weeks later for my birthday, the manager treated us to some on-the-house appetizers, and surprised me with a plate of profiteroles (a pastry ball filled with cream) covered with chocolate sauce. The presentation was exquisite, as the waiter brought out a pitcher of chocolate sauce to pour over the top of the pile of profiteroles, and asked me to say when. I laughed and told him he was asking the wrong person to tell him to stop pouring chocolate, and I’m pretty sure he poured the entire pitcher out until the sauce was nearly dripping off my plate. This year, I chose to split a plate of their silky smooth chocolate mousse with my friend Emily, as I had shared two dinners between myself and my Chocolate Companion. The mousse plates are always put together at the table, as a waiter brings a large pot of the stuff out, and dishes up the quenelles table side, and then sprinkles them with white and dark chocolate shavings. 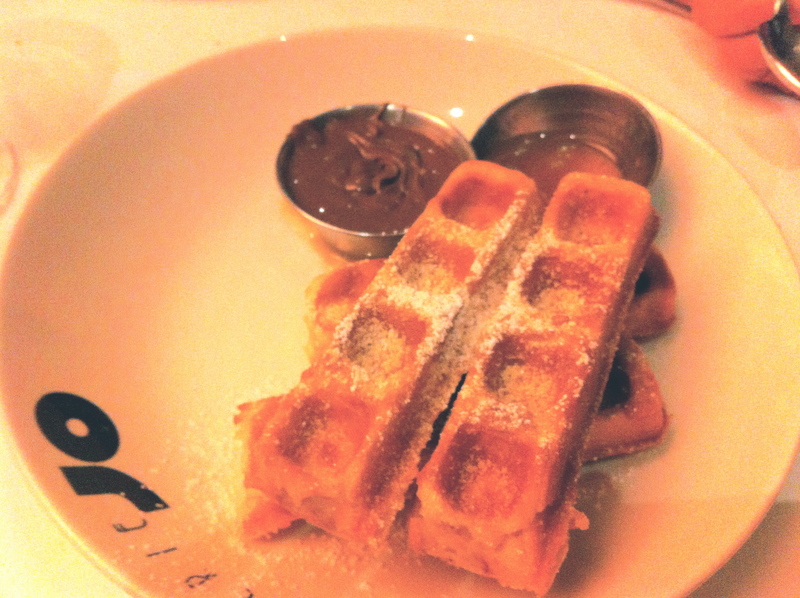 For himself, my Chocolate Companion chose a new dessert item, the Belgian waffle sticks, which came with a cup of Nutella and salted caramel for dipping. I got to try a bite, and they were indeed delicious. I did notice that on their brunch menu, they do serve a chocolate French toast with almonds for. While I don’t see myself going there during the daylight hours (there is something undeniably romantic about the setting that begs for dinners and drinks), it nevertheless does sound intriguing.